If the Hitachi UT32MH40U were a catwalk model, it would probably be described as being of the anorexic variety. Why is it so thin? One of the reasons is that there's no built-in tuner – something of a no-no in today's added-value obsessed buyer's market. Luckily, Hitachi is providing a free external Freeview box with every 32in, 37in and 42in model from this month, so no worries there. Slightly unusual, but not a problem. Another quirk is that this set has been designed to sit on an optional ﬂoor stand, which is a long pole, rather than the supplied desktop stand. With an appealing looking backside, it certainly looks the part in glorious isolation, but such an arrangement would make little sense in most living rooms where there are external sources to be connected and cables to trail. Most manufacturers rightly boast about the large number of sockets on each of their models. Not so here. Hitachi uses the single HDMI input as a key selling point and an HDMI switcher looks an absolute necessity for DVD, Blu-ray, game console, and so on. There is a PC input and a stereo audio mini-jack (for PC audio) if you wish to use the UT32MH40U as a computer display, however. One beneﬁt of this minimal connectivity approach is you get a much less cluttered remote control than normal. Just a few basic controls adorn the UT32MH40U's remote, which is something of a blessing considering the usual amount of complicated remotes cluttering the arms of the What Plasma & LCD TV sofas. The usual reaction to something so dominated by its design is to question whether it is a triumph of form over functionality. Happily the UT32MH40U disproves that rule. The Matrix on Blu-ray proves an excellent test disc in revealing the screen's superbly realistic and varied colour palette. 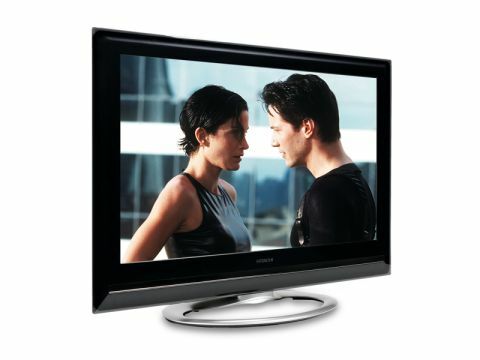 Many LCD TVs are prone to rather muted colours, while others are so vivid they practically scorch your eyes out. The UT32MH40U is subtle yet bold, and really brings the action of The Matrix to life despite rather average blacks. When Mr Anderson falls asleep at his computer monitor, the gloomy night scene has little of the shadowy detail that superior models – such as Pioneer's PDP-LX5090 – deliver and the cascading computer code simply doesn't sparkle. Squeezing a Full HD Blu-ray image into a 1366 x 768 pixel screen isn't a problem for the UT32MH40U, produces a picture that's blessed with as much depth as it is with natural colour. On the down side, we noticed that fast-moving scenes and quick camera pans do suffer from noticeable judder, a traditional problem of LCD technology. The other main problem with this TV is its tiny speakers, which put in a largely drab performance, although there's enough treble detail to make ordinary TV watching no problem. Considering its extremely thin frame, that's actually a pretty impressive feat. It's hard not to fall in love with the Hitachi UT32MH40U from an aesthetic point of view. It's a remarkably good-looking model and its functional compromises may not be insurmountable problems given its decent all-round performance.